Prior to the second exhibition of my work in New York City, Mildred Hawn and I were invited to Braniff Airlines Headquarters to meet over lunch with their executives. During the meal we were offered a Braniff International Airways 707 jet for our exclusive use. We couldn’t refuse the amazing offer; it was to ferry an ever increasing group of Dallasites and folks from other cities that were to attend the formal opening of my exhibit. It would be a sojourn of art immersion on the East Coast with visits to museums, galleries, and tours of private art collections. Our plan was to land in Washington D.C, pick up Nancy Carroll and fly to Philadelphia, Pennsylvania. It was quite a trip heading into a D.C. snowstorm; the pilot announced a change in itinerary, we would instead be landing in New York. On the ground buses were queued waiting for our group. Our caravan eventually made it to Philadelphia where Nancy Carroll, having made the travel adjustment on her own, greeted us. Margaret and Gene McDermott and I had many occasions to refer to paintings that we had seen in the famed art collection of American chemist Dr. Albert Barnes in Merion, Pennsylvania and of the private collections that painter and art teacher Hobson Pittman led us through in Philadelphia. I knew that Gene had invested in Braniff International Airways by purchasing a significant amount of its stock shares. I also knew that some of the stock purchases made by Gene were bought from William Arvis "Dollar Bill" Blakley. Blakley was appointed to the U.S. Senate after Lyndon Baines Johnson vacated the seat to become John F. Kennedy’s running mate in the 1960 presidential election. My gut feeling was that Gene, having been active at the Dallas Museum of Fine Arts prior to his 1955 marriage to Margaret, realized that she wanted to assemble an important art collection. But Gene knew that Margaret’s first purchase of an early Van Gogh work had not been an impressive choice. The purchase was a common mistake made by other collectors: right artist, wrong work. So the evidence was clear: our having access to and use of a Branniff jet, coupled with Gene’s presence and other circumstances, was no accident. This alignment of occurrences strongly indicated that the McDermotts were contemplating for me to be their guide and advisor for their art collection. I passed muster. It would be a sure-fire bet that Jerry Bywaters and Wildenstein Gallery principal Louis Goldenberg had a hand in Margaret and Gene’s decision to make me their advisor. Among the first batch of photos and provenance sent to Atelier Chapman Kelley of available works from Wildenstein Gallery was a quintessential painting. It was “Dancer with Fan,” 1879, 17⅝ x 11⅜ by French Impressionist Edgar Degas. It is a superb example of his mature work. At $325,000 it was by far more expensive than the others in the group. It cost more than what Margaret McDermott was willing to consider. However, in my opinion I considered the work well worth it. Margaret was reticent to buy it. In fact she was dismissive because of the price. I persisted and convinced Gene to buy it for her and he did. Margaret asked Wildenstein Gallery president Louis Goldenberg to pay me a commission on the sale. He sent $1,500 which pleased me. Margaret did not buy into the strict sales rules that I had set up with Wildenstein Gallery. Instead, she went through endless haggling which delayed the closing of a sale. This sort of negotiating was costly to a gallery and necessitated a price mark up in order to give a price mark down to cover the cost of the delay. This was a legitimate part of the business but one that I had eliminated from my own dealings confident and comfortable with my “one price for everybody” business practice. In the mid-1970s a Claude Monet “Poplars” work was the last painting that I had recommended to Margaret, but she did not purchase it through my gallery. By then Gene had died. I learned that she apparently paid 10% to 20% more for it than the amount I had offered to sell it to other collectors! I suspect that she paid this avoidable premium, across the board, because of her lack of trust in my sales arrangement with Wldenstein Gallery. While Margaret’s new house was under construction, she unexpectedly sent to me two works from her personal collection. One was a 1946 red landscape by Georgia O’Keeffe. The other was an original on the theme of the artist and his model series by Pablo Picasso. I hung these “on loan” pieces in my studio. What joy! After the new McDermott house was finished, my former art student Richard Childers and I set up shop in the McDermott garage to refinish the paintings’ frames to best advantage. On a daily basis we were to alert the majordomo if we were not to be expected for lunch. 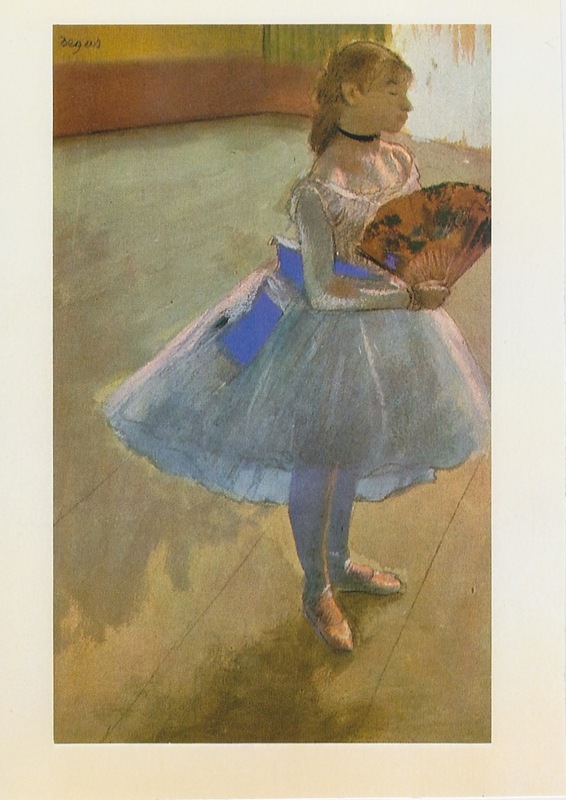 In the mid-1960s, before completing the refinishing of the Degas “Dancer with Fan” frame, to assure the painting’s security I would take the work home for the night. Throughout the decade that I was involved with the McDermott collection we would have at times several valuable paintings awaiting completion of their frames. Another security measure to make sure the paintings were theft proof would be for someone to sleep overnight with them. Shippers of paintings to be considered for purchase by the McDermotts were instructed to send them directly to Atelier Chapman Kelley. The venerable Upper East Side N.Y. Knoedler Gallery (165 years in business) was among the galleries sending work to ACK for Margaret. ﻿ ﻿﻿ Margaret, having married while in her mid-40s, was determined to leave her mark on Dallas. And she has done so in spades --with a little help from her “team.” For example, I joined her for lunch with architect Ieoh Ming Pei, designer of the East Building of the National Gallery of Art in Washington, to discuss his plans for the new Dallas City Hall building. And when she and my friend, banker and art student R. L. “Bob” Thornton Jr. were appointed to organize the city colleges, Margaret invited me for lunch, without Thornton, to determine if we could agree on the architects who would design the seven college campuses. We did reach an agreement that major American Southwest architect O’Neal Ford should be one of the architects. However, for political reasons Ford would not be acceptable. Margaret knew of my professional relationship with Bob Thornton Jr. She felt that I might be the only man in Dallas with who Bob would be comfortable discussing aesthetics. She asked me to make an attempt to convince him to back all of our seven project architects. Of course when I went to Bob’s office the first thing he said was that Margaret could be a bear about architects. He asked my advice, I told him of Margaret’s wishes—and bingo—that’s the way things got done! Bob retired and became an avid and serious painter enjoying every minute of his new life. He invited me to see his work, but as I was living in Chicago at the time, sad to say, I never had the opportunity. Because I had been very active with the Dallas Museum for Contemporary Art and the Dallas Museum of Fine Art I had first hand knowledge of the dynamics at play and of the proposed merger of the two. Museum director Douglas MacAgy mounted some interesting exhibits at the DMCA. The 1962 survey show of works from New York was a real treat. Another was the first U.S. retrospective exhibition of Belgian surrealist painter René Magritte. That show was a great introduction to Magritte although surrealism was far from new and no longer cutting edge. One MacAgy exhibition included the work of painter Gerald Murphy; but it did not elevate Murrphy above dilettantism. MacAgy’s “The Art That Broke the Looking Glass“ left everyone scratching their heads as we sought to understand the work’s theme, let alone absorb its purported historical significance. In the 50 years since I have not heard it mentioned once. MacAgy’s exhibitions were no more daring or contemporary than what Jerry Bywaters was showing at the Dallas Museum of Fine Arts where Bywaters also had other periods of art to cover. For instance, the DMFA acquired a great “drip period” painting made by Jackson Pollock, “Cathedral” (1947); the DMFA was already way ahead of the pack. Even a personal appearance by Josef Albers, whose work “formed the basis of some of the most influential and far-reaching art education programs of the 20th century,“ was a superb treat and a lesson for all of Dallas. Unfortunately, under MacAgy the DMCA was never able to develop a solid audience and failed to attract additional backer support. MacAgy lasted only a few years as director. By 1961 DCMA was forced to begin talking merger plans with the DMFA--not to be finalized until 1963. I recall a DMCA meeting where Betty Blake (Guiberson) was almost weeping and plead for extending the life of the DMCA. Victims of this merger were DMFA’s Jerry Bywaters and DMCA’s Urban and Jeanne Neininger. The Neiningers were delightful people--I always thought that Urban had the closest ties to the New York artists. Because a museum directorship is such a highly visible position, given his severe stuttering condition it was doubtful whether Urban could be a successful director—otherwise he might have been able to make the DMCA work. The DCMA – DMFA merger provided the opportunity to have one museum director. Merrill C. Rueppel would be that person. According to the Boston Globe newspaper, before coming to Dallas, Rueppel had a troubled career at the St. Louis Art Museum. James Clark was fingered by the Globe as the party who chose Reuppel to become the director of the DMFA. My involvement with the DMFA led to various interactions with Reuppel. I am not alone in characterizing him as being arrogant. Reuppel came off as being jealous of painters and sculptors. As with many museum directors and curators outside the sphere of the New York art scene, Reuppel fancied himself to be the “King” of the Dallas - Ft. Worth area. He wished his position as museum director to determine which art pieces collectors were to buy and the prices they were to pay. For this service many museum directors and curators unfairly demanded sales commissions from New York art dealers. When he learned that Dallas painters Don Vogel, Ann Cushing Gantz and I operated art galleries and that I was regularly advising Margaret McDermott and James Clark about their art collections, Merrill became outraged. He knew that painters, sculptors and other creative types can demonstrate our “eye” for high quality content and meaning and that others could verify our professional credentials and standing. For centuries artists have been chosen as advisors by serious, forward-looking collectors. Artists as advisors include: Mary Cassatt, Arthur B. Davies, “Ashcan school” movement cofounder William James Glackens, Jacques Lipchitz and Diego Velázquez; Johannes Vermeer was an art dealer. When Reuppel learned that I had again won the top prize at the Texas Annual Exhibition in 1964 he cancelled the DMFA’s co-sponsorship of future exhibitions. That exhibition had grown to such stature as to be jointly sponsored by major Texas museums. Prize winners were routinely announced in museum catalogs. But when the time came to announce that I had won, it was omitted from print…petty, petty. The public was kept in the dark about my prize until the exhibition opened at the Witte Museum of San Antonio, Texas; the Witte Museum’s catalog noted my prize. Next on Reuppel’s hit list was his order to close the DMFA’s art school. He had a confrontation with sculptor and art teacher Octavio Medellin about the school. I convinced Margaret McDermott to have a committee hearing on the matter and it did take place. I felt that all of the options should be discussed such whether to close the school, work at improving it, or for it to remain unchanged. Jerry Bywaters, who at the time was the art department chair at Southern Methodist University, said that the DMFA’s art school should be improved. Jerry felt that the likes of DMFA’s art school teachers Otis Dozier, Octavio Medellin and myself was reason enough to keep the school viable. Bywaters had been unsuccessful in recruiting these same people to teach at SMU. I had declined Jerry’s offer to teach there since the early 1960s. I vividly remember Jim Clark’s phone call to me about the committee’s recommendation to improve the school; it had been adopted by the DMFA’s board of trustees. Historically, most professional art schools have been attached to museums beginning with the Pennsylvania Academy of the Fine Arts in the 1700s, Museum of Fine Art, Boston, Corcoran in Washington, D.C., Art Institute of Chicago. Given what we knew about Reuppel, predictably the DMFA’s art school was closed anyway. Margaret McDermott and I attended a lecture by Reuppel on 19th Century American art history which was his field of study. I noted that he had not only failed to mention the first museum and art school in the U.S., the Pennsylvania Academy of the Fine Arts, which graduated such illustrious names as Mary Cassatt, Thomas Eakins, the Peal family, and many of the “Ashcan School” movement’ s artists. Reuppel mischaracterized Cassatt as having been trained in Europe. McDermott asked me write him a note pointing out the omission and errors. His reply to me was rude. Reuppel said that I should take the wax out of my ears. And he denied that he had said that Cassatt was not U.S. trained before she settled in Paris! A tape recording exists, made by Ann Cushing Gantz, painter and former teacher at the DMFA school’s regular high school art class, where Ann tells of a talk by Reuppel at Hockaday High School. Painter Ruth Harrison was then head of the art department. On the recording Reuppel was asked why he did not look at Texas artists’’ work. His priceless reply was that if we were any good we would have already left for New York. What about his situation? If his career was so great--he studied in Wisconsin, was at the St. Louis Art Museum and DMFA, but no New York offers! 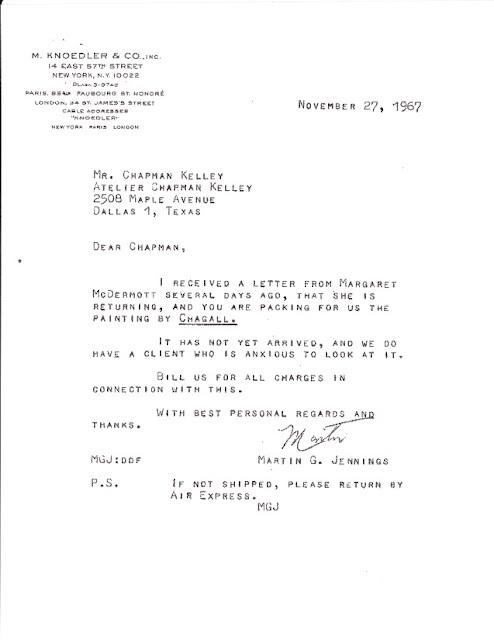 By about 1968 many artists, civic leaders and art patrons were so disgusted with Reuppel that rumors surfaced about the McDermott art collection: it was about to be lost to the University of Texas. When I asked Margaret about the rumor her reply was that she and I had worked so hard to see that her collection would compliment what the DMFA already had—that nothing was further from her mind. Of course I urged her to make no commitment about moving her art collection until we had the chance to make the management of the Dallas museum, one that was so good and well run, that no Dallasite would ever consider leaving their art collection elsewhere. To have a say on how the DMFA was managed—the “move the McDermott art collection” rumor nudged concerned artists in that direction. A local chapter was formed of the National Artists Equity. The purpose of the chapter was to draft a credentialed artist to represent all image makers to the board of the DMFA. A NAE requirement was that one had to have considerable community recognition to belong. Dallas sculptor Arthur Koch, who was trained at the Rhode Island School of Design and the University of Washington, and is one of the most successful artists, was voted to represent the NAE. Koch is one of the best art teachers in the area. He is an exceptional person. The NAE membership was large and it grew to represent the professional world of Dallas artists. Suddenly, Reuppel vanished from Dallas without any official museum explanation. In time we learned that he had been named director of the prestigious Museum of Fine Art, Boston. According to the Boston Globe newspaper, Reuppel immediately offended that museum’s curators and others. A year or so later I received a phone call from Boston Globe reporter Otile McManus. She asked me if I knew of Merrill Reuppel. I told her I did and invited her to visit Dallas to learn more, which she did. I introduced her to various art world figures and arranged for Ed Bearden, a DMFA senior staff member, to take her into the museum’s basement storage area to view the still unannounced and still unexhibited (at the time about nine years had gone by since Jim Clark had donated them to the DMFA) alleged works by 19th century French painter Henri Fantin-Latour. So the key to this mystery was that art collector James Clark had donated these dubious paintings in order to take a $40,000 U.S. federal income tax deduction as if the works were authentic. Apparently Reuppel accepted the two “Fantin-Latours,” definitely not to exhibit them, but for other reasons, perhaps for Clark to take advantage of a big federal income tax deduction, what else could it be? Jim Clark admitted to reporter McManus that he had in fact claimed a federal income tax deduction and that he knew the artwork’s authenticity was questionable. This and much else was revealed by the Boston Globe in its March 7 and 19, 1975 newspaper editions and an article appeared in Time Magazine. The Tuesday, June 10, 1975 Globe headline stated, “MUSEUM TRUSTEES FIRE REUPPEL.” And on the same day, in the New York Times, “BOSTON MUSEUM OUSTS DIRECTOR,” a blunt term I had never before or ever since seen printed about a museum director’s leave-taking. All of the above is copyrighted material, all rights reserved. Permission for use will be considered upon written request. Blog comments are encouraged, the use of actual full names is strongly recommended, as are affiliations with organizations.